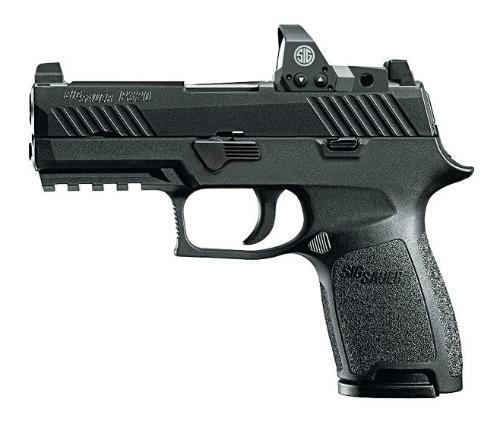 The Sig P320 RX Fullsize model proved to be an excellent success for Sig, but, right after it was introduced at the 2016 SHOT show, Sig fans and customers started asking for a similar RX version in the ultra popular P320 Compact frame. Sig listened and introduced the P320 RX Compact model at the 2017 SHOT show. Like its fullsize cousin, the P320 RX Compact comes equipped with an RMR (which stands for Ruggedized Miniature Reflex) milled slide and the Sig Romeo1 sight mounted. Both the P320 RX FS and P320 RX Compact are currently the only 2 pistols on the market to come pre-equipped with an RMR milled slide and a RMR sight. Over the years, there’s been a subtle push for RMR sights for CCW and the P320 RX Compact looks to be the first out of the box model to fit that need. The Romeo1 is a good sight and is about the same size as the Trijicon RMR or Leupold Deltapoint models. The Romeo1 is powered by a CR1632 battery (a common watch battery), which can be replaced via a top loading chamber. This is a huge plus as you don’t have the remove the sight in order to change the battery. Currently the P320 RX Compact model is only available from Sig in 2 models, a 15 round version and a 10 round version for states with a restrictive magazine capacity. Both models are currently only available in a 9mm caliber, but it’s only a matter of time before Sig starts offering other caliber conversion kits for the RX Compact series. Like the P320 RX Fullsize model, the Compact RX version also features “suppressor ready” sights which are tall enough to allow the shooter to use either the RMR sight or the traditional sights in any situation (for example, should the RMR fail for some reason). This approach offers the best of both worlds for sight acquisition in a CCW or self defense scenario. #1 – Will the P320 RX Compact fit in a holster made for a standard P320C? Unfortunately, most won’t due to the RMR sight and higher than average front and rear sights. You’ll most likely need a holster specifically made for the P320C RX. #2 – I’m having real trouble finding a holster made specifically to fit the Sig P320 RX Compact. Do you have anything to fit as the RMR sight on the pistol won’t fit in a holster made for the standard P320C? Any holster listed on this page below is made in a version to fit the P320 RX Compact pistol. A slot is cut into the top area of each holster to accommodate the Romeo1 RMR sight. In addition, these holsters feature a higher sight track to accommodate the taller suppressor ready sights. #3 – Can you recommend or suggest a good Sig P320 RX Compact IWB holster? #4 – I have both the P320 fullsize and compact RX models. Do you offer a holster that will fit both models so I don’t have to purchase two holsters? Technically, you could purchase a holster made for the fullsize version and the Compact version would also fit into it. You’d just end up with a little bit of surplus holster at the end as the Compact has a shorter barrel. #5 – I purchased a belt slide holster off Ebay that supposedly would fit the P320 RX Compact but it wouldn’t as the front sight kept getting caught on the holster during the draw. Are you sure your holsters will fit? It sounds as though you bought an open bottom holster that didn’t fully cover the barrel? If so, it makes sense that the front sight would get caught on the bottom of the holster during the draw as the front sight on the P320 RX compact is taller than the front sight on a standard P320 model. We don’t recommend any open bottom or slide style holsters for any of the P320 RX models for that very reason. #6 - I see you carry holsters for the P320 RX Compact, but do you have anything for the Sig P320 RX fullsize model? Yes and those holsters for the Sig P320 RX fullsize model can be seen here. Any model listed below is available in a Sig P320 RX compact holster.